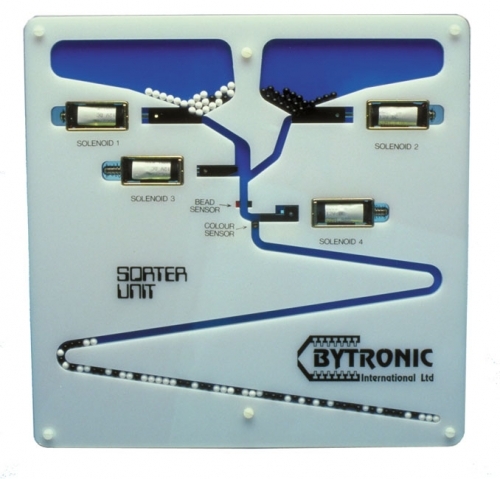 The Sorter Unit (SRU) is designed to be used as a control application from PC or microcontroller. The SRU includes the use of opto-electronic sensors for counting and sorting and control of linear solenoid actuators. The SR is a two dimensional bead sorting and counting system that has two distinct functions. It is a three-layer sandwich construction, which encapsulates fifty white beads, and fifty black beads, which are free to move around a pattern of hoppers with tracks cut into the middle layer. Bead Pattern Creation: The unit has two hoppers to store two different coloured beads. Two linear electrical solenoids are used to open and close gates at the outlets of the hoppers. If either solenoid is briefly de-energised, a bead of the appropriate colour is released from the hopper and rolls down the zigzag track that has a number of possible bead patterns in the track. Feedback from an infrared through-beam sensor is used to ascertain if a bead has been successfully dispensed each time. Bead Sorting: When both hoppers are empty and the required bead pattern has been achieved the unit may be turned upside down to allow the beads to be sorted back into their respective hoppers. A second pair of solenoids are used to deflect each coloured bead into a hopper and an infrared reflective sensor is used to determine the colour of each bead. The sensor’s output sends a binary signal to the computer to signify black or white depending upon how much of the infrared beam is reflected from the bead. An audible indicator on the SRU is used to indicate ‘end of sequence’ or that an error has occurred. A PC fitted with a suitable internal interface card can be used to connect to the SRU through the IDC header and Programing software used to write a control programs for the Unit. A microprocessor can also be used for control.